A raw and vivid story of a family's struggle with mental illness. Everyone knows that parenting a teenager can be difficult, but when the teenager has severe mental illness, an addiction, and is repeatedly trying to kill himself, it is life altering. Matthew is fourteen years old when he first starts cutting. He is fourteen when he is first admitted into a psychiatric hospital, spending the next two birthdays in psychiatric facilities trying to overcome his illness and addiction. 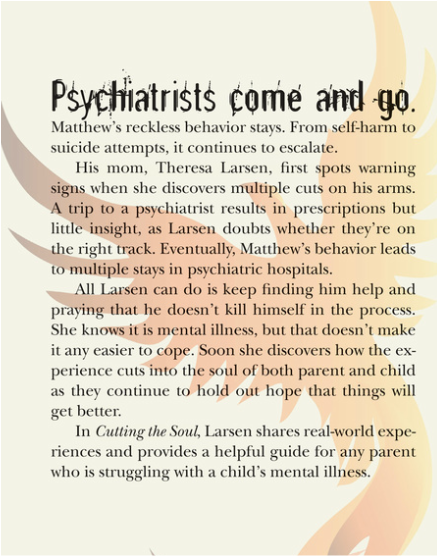 Cutting the Soul is a journey into the mind of a mentally ill teenager as he faces intense feelings of depression, psychosis, addictive cutting, and suicidal behavior. This memoir details four years of Matthew's life through the eyes of his mother, health care workers, and Matthew's own journals. It shows the desperation of a mother battling through the world of mental health and her own "demons" of the past and present, in an effort to save her son. It is an informative guide into mental illness today and illustrates how it is an illness in need of a treatment. This is a story for everyone, not just those directly experiencing mental illness. Please view all the pages on this site and visit weekly to read the blogs. Follow the "buy book" button at the top of this page. It will take you directly to Amazon to purchase in paperback or on kindle. If you do not have a kindle the book can be uploaded to any smartphone, tablet, or computer using the free kindle app from Amazon. Thank you for your support.